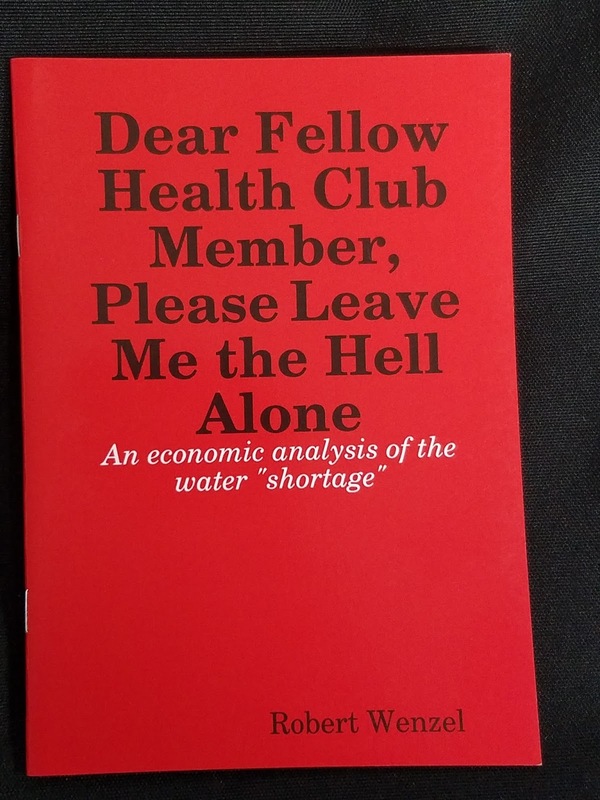 I really don't know how Amazon can offer it at this price, but my booklet, Dear Fellow Health Club Member, Please Leave Me the Hell Alone:An economic analysis of the water "shortage", is back on sale for $5.54. It cost me more to but copies from the printer. I bought this for about $5 when there was a sale but I think it's worth even the full price. Even though it's short and can be finished in one reading, it is one of the funniest things I have read in a while! The economic analysis in this book is enjoyable to read, makes you think, and is information-dense! 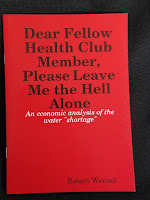 I find Robert Wenzel's humor particularly funny, probably because of his writing style and the context of why this book exists in the first place, which you will read about in the introduction. I won't spoil it for you in this review, though. I highly recommend it. If you don't already follow economics (it can be a highly entertaining subject to study! ), you probably will get a lot out of this. But it from Amazon here.